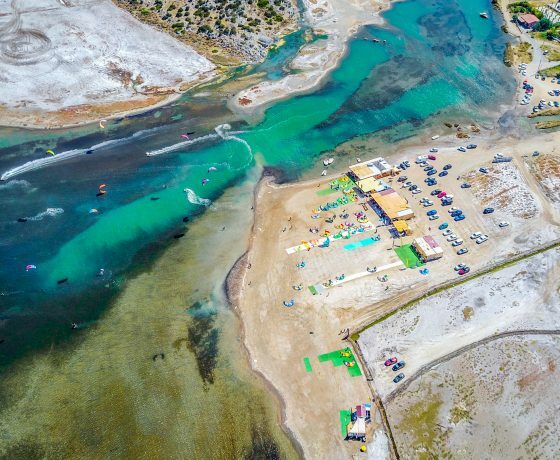 Welcome to Gülbahçe, Urla, our secret kitesurfing spot in Turkey, and European summer base of 2019. 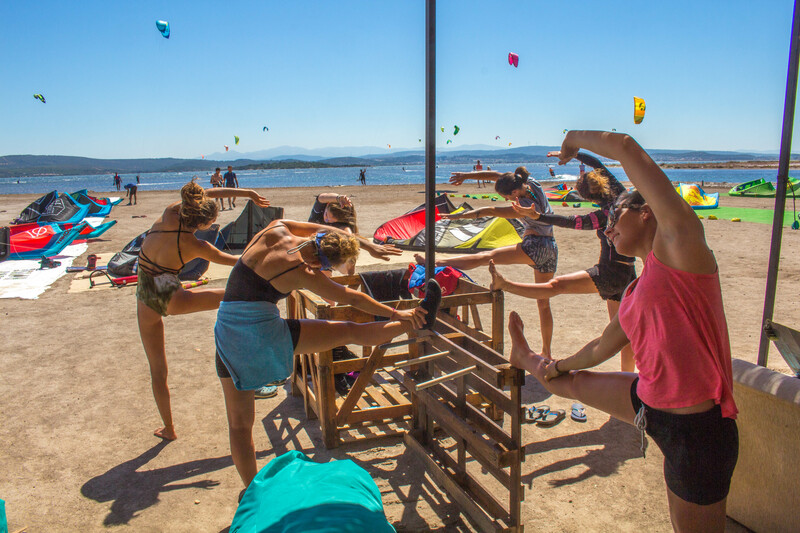 With spots like Alaçati and Gökova in the area around, Urla is already a famous destination for kiteboarding. Gülbahçe is ready to become a populair kite destination as well. But up until now it never got crowded at this place. Exactly the reason why we go here before it does! 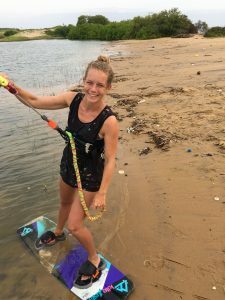 This kiteboarding trip has it all: beautiful landscapes, accommodation at a low profile surf lodge (including all meals), around 30 sunny degrees on your head and friendly locals. But especially: super lovely kiteboarding conditions for every level. The big, shallow flat water lagoon right at our doorstep is suitable for beginners as well as freestylers. 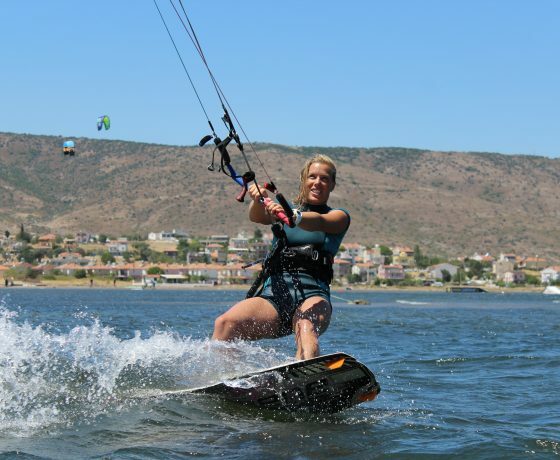 It is perfect for our intensive coaching pack, which is included on this kitesurfing trip. As an extra addition to this trip we offer an intensive kitesurfing coaching program + video analysis with a well known French / Turkish coaching couple (check ‘crew’ tab for more info). This program will take place in small groups and will definitely bring you to your next level of kiteboarding. 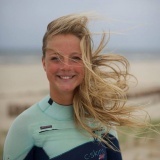 Of course also Kelly & Maroean crew will be 24/7 around for the support we always give you at our kite camps. But trust us, Pinar (“PinPin”) will make you do that extra mile! The program includes a warming up and stretching class before and after the coaching session, 2 hours of intensive training on the water (2x per week), and a one on one video analysis (1x per week). In between the program you will be able to practice a lot, to get your progression to a maximum. You can choose what language you want to be coached in: English, French or Turkish. Next to being the perfect kiteboarding destination with the wind blowing almost every afternoon, we have a storage full of board sport toys available at the surf lodge. We like! Grab a skateboard and hit the miniramp or rent a paddleboard to cruise in the river. For shopping, markets, bars and restaurants, we will bring you to beautiful places around, like Alaçati and Izmir. We will also do a downwinder, organize a barbecue and sing at the campfire. Join alone or enjoy a stay with your girlfriends. 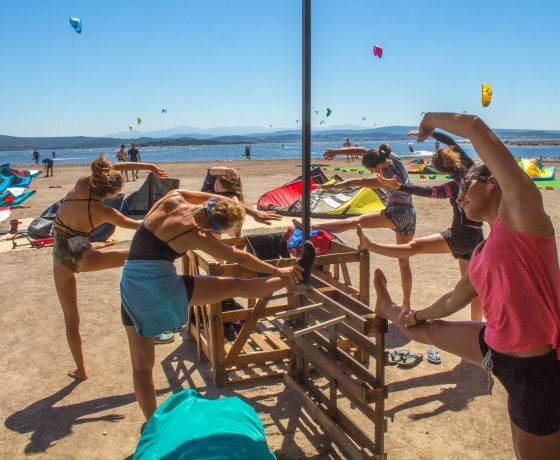 We look forward meeting you at our kitesurfing camp at Gülbahçe, Turkey! 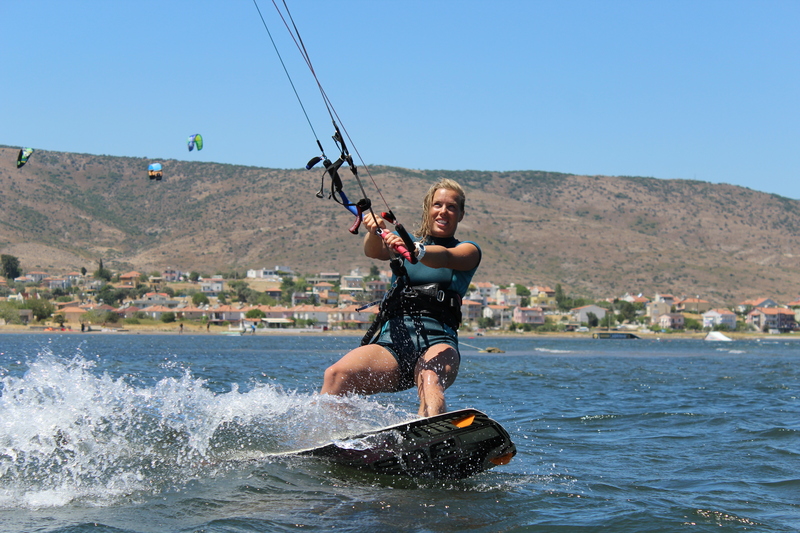 The area of Urla offers high quality kitesurf possibilities. The large, flat water lagoon is where most of the kitesurfing takes place during this camp. At different states of the tide, the shallow water creates super flat circumstances, perfect for learning waterstarts or nailing that handle pass you have been working on. With enough space to accommodate everyone who wants to ride, there are no crossed lines or near misses. For the real dare devils, there are a few wakestyle obstacles right in front of the beach. With our exclusive progression coaching pack, Nico and Pinar will get you to a higher level for sure! High season spans June, July and August, with good and consistent wind. The wind is side shore and makes it easy to return to the beach. The wind is strongest in the morning, when 8m kites are most common (typical wind 18-25+ knots). In the middle of the afternoon the wind drops slowly to 10m kite weather, and slowly dies by the end of the afternoon. There is sand everywhere in the kiting area, with bits of seaweed, so you don’t really need booties if you are not a complete beginner. Water temperature in the lagoon is usually warm in high season, but for those wanting to kite all day, wearing clothes is recommended to protect the skin from burning. 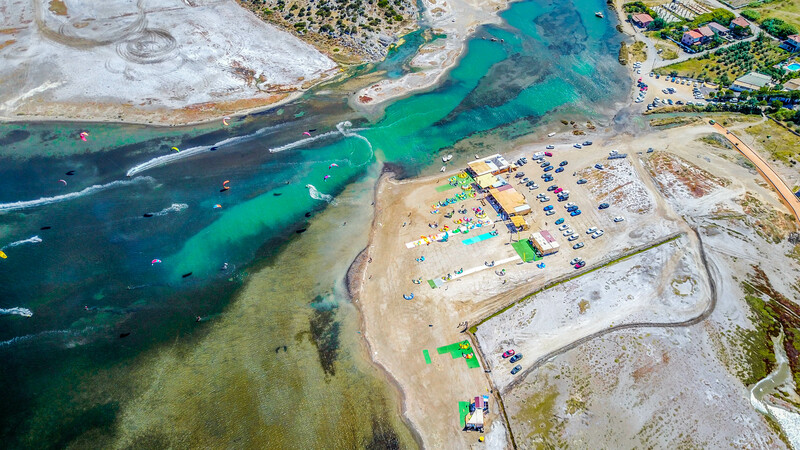 With a beautiful coastline, natural parks and historical sites right on its doorstep, it is not surprising that the area of Urla is such a popular choice for visitors from all over Turkey and beyond. Located close to Izmir, small traditional fisherman village Gülbahçe is set in a landscape of rolling hills, shallow lagoons and panoramic vistas of the river. Besides kitesurfing there are many other things to do. Spend your days wandering through the weaving streets of the charming fishing village Alaçati, discover the flora and fauna of the wide area and go explore the different wine and oil farms. Or buy amazing Turkish goods at the big markets of Izmir. We will stay at a small surf house near to the kite lagoon (50 meters walking distance) and the village. It is a nice, quiet and cosy accommodation with all the basics you wish for. 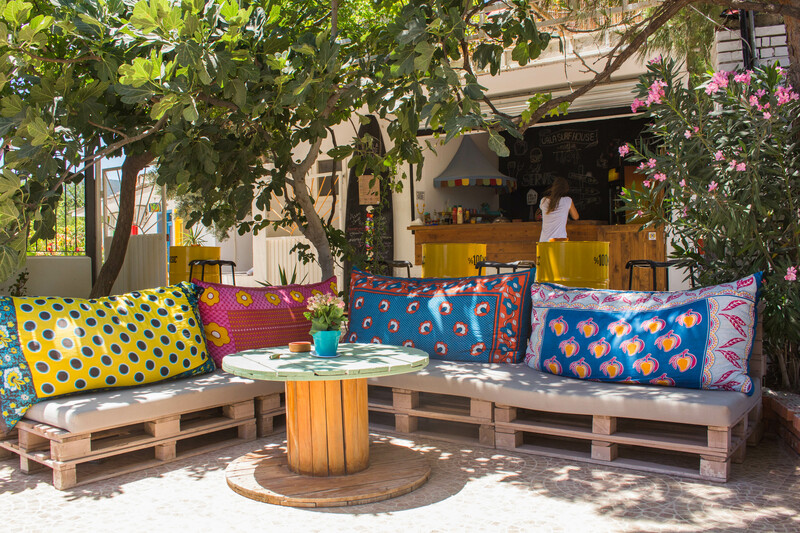 There are plenty of corners to chill, a big terrace with view on the lagoon and a pool with hammocks & bean bags. There are 11 rooms; garden rooms, river rooms and beach rooms. Each room has his own unique decoration. Think of Brazil, Zanzibar and France, or Skate, Snowboard, Surf and (of course) a Kite room. On this trip we use twin and double rooms which will never have more than two people in one room. The house has a big kitchen in which the cooks prepare delicious local food. Daily breakfast is included and will be served in the garden, next to the pool. Also included is tasty and healthy food for lunch, either on the beach, in the front yard, or next to the pool. And every night you can join our open buffet dinner with Turkish specialties, cooked mom’s way. And don’t forget the bbq night. Yum! The house is board sport minded, so perfect for our guests! It has lots of board sport toys and offers next to kitesurfing also SUP, skateboarding and wakeboarding. But part of the board sport culture is to also chill out. So after an active and adventurous day with new (kitesurfing) experiences, it is important to sit down and relax. 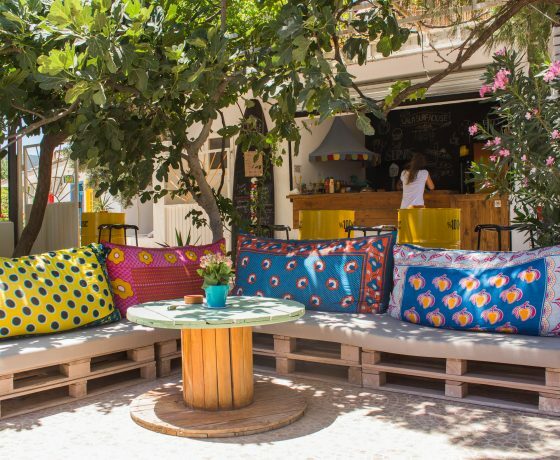 Take a fruit juice by the pool, drink a beer in the chill out area or have a glass of wine at the ZanziBar. If the mood calls for it, an interesting video analysis given by the crew could tempt those needs. Also spending an evening in Alaçati is an option. We can go to a market, have some food and end with a drink and a dance. Flights to Izmir Airport are not included in the trip. But of course we are more than happy to help and advice you as we have done the trip many times. There are different ways to get to Izmir airport. The most popular airlines are TUI, SunExpress, Turkish Airlines and Correndon, plus a number of other smaller charter companies. The airline also depends on your country of departure. There are charters that fly directly from Brussels or Dusseldorf. Usually flights are available from € 350,- both ways. Don’t forget to check luggage prices in case you bring your own kite gear! When you arrive at Izmir Airport there will be a transfer arranged by Oceanbirdz that brings you in one hour to the accommodation. We will be awaiting you with a refreshing drink! To visit Turkey you need a visa. It it easiest to arrange this (online) before you start traveling. Also, your passport needs to be valid for 6 more months to get into the country. + Private room (when still available) € 40,- per night. * We have a no wind policy for lessons and gear rental. In case there is no wind we will offer other board sport options or replace the lessons when possible. Please note that the kite lesson prices are special offers only for our camp guests! We have only 10 spots per week to keep the trip exclusive and give everybody all the attention needed. Want to secure your spot? Book the trip through the button below.